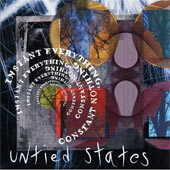 Untied States are an Atlanta band that has been around for a good long time. With a revolving cast of members revolving around the core of guitarists Colin Arnstein and Skip Engelbrecht, this band has changed its sound more than once over the years. Unfortunately, in all my live encounters with the band, something has always gone horribly amiss. Whether they're the band with the multi-colored lamps in the midst of a large festival or whether they're the band playing an overheated teahouse (with no tea) so loudly that I couldn't notice that one guitar wasn't plugged in, each time I've run into Untied States in a live venue, I haven't been very impressed. However, when we got the promo for the band's new record, Instant Everything, Constant Nothing, PostLibyan handed it over to me and told me I should give them one more chance. In retrospect, I'm kind of glad he did. While I have some issues with the record, Instance Everything, Constant Nothing at least removes Untied States from the vagaries of the live experience and allows me as the listener to really hear for the first time what the band's trying to accomplish. Upon first listen, my impression is that Untied States are a lot more melodic than I had remembered. Sure, the hooks are somewhat buried under a layer of noisy effects and guitar distortion, but there's still tension at the core of the melody. As an example, Not Fences, Mere Masks, the second track on the record, combines the simmering guitar effects with a thudding bass riff which accts as the primary anchor for the song. At the same time, the slightly syncopated, skittering drumwork propels the music as it changes rhythm and tone, making it sound a bit like a more intense tune by The Liverhearts. Likewise, Bye Bye Bi-Polar, a later tune on the record, manages to place some synth-y samples on top of a nicely meandering guitar melody and some post-punky repetitious drumwork before breaking apart into a slower discordant bridge which then returns to the earlier musical form. It's a bit like The Octopus Project filtered through some Fugazi and with a slight touch of the drive of Rizzudo served on top. Finally, Delusions Are Grander begins with a vocal line over that same post-punk style before the samples break in and the tone becomes subsequently louder and more insistent without losing the slightly bouncier melody that remains at the core of the song (despite the occasional vocal yelps and screamo modality). In the past, as I heard this band live, I think I only heard the screams and distortion, while these songs in a recorded medium show that there is a consistent melody to their madness. However, it's probably not surprising that I find the slower, more focused moments (which are fleeting) on this record more appealing. For instance, Unsilvered Mirrors begins with some synth chords over which the vocals come across as more psychedelic and less punky. Admittedly, after a good 45 seconds of this, the band then breaks into something more driving and noisy than that which had come before, which falls into line with the majority of the record. Nevertheless, the vocals and the melody remain a bit more drawn out so that the contrast between the two tones creates more tension within the song. Likewise, These Dead Birds begins with a slowly developed bass-oriented melody where the higher-pitched, still effected vocals only emphasize the heavier bass line in the foreground. And, despite the addition of some samples, as the song becomes louder and more insistent, that underlying melody keeps returning, and keeps things more grounded than on some of the other songs. Still, these lighter touches aren't the focus on Instant Everything, Constant Nothing, as the band remains true to their post-punk, noise rock influences. In the end, Instant Everything, Constant Nothing cannot be described as an easy listen. But it is more interesting and more digestible than any of the live shows I've seen Untied States perform. It's clearly a record where the various influences of the band play a major role in how they structure their tunes (and I'd be remiss if I didn't mention that it's clear they've been influenced by Sonic Youth), but at the same time, the influences meld together in a different way than I've heard previously. I suspect that, if the band can keep a more stable line-up, as time goes by the songs and tunes will become more coherent and less skittering, which means that this band should become more organic sounding over time.